Let us make your upcoming event a unique experience for you and your guests! At Eat Sum More, we understand the value of high quality food at a reasonable price. And we also want your guests to be raving about the experience! Cooking is not just a job for us. It’s our passion! We are proud to serve you bold and flavorful South African meals. When you hire us to take care of your catering needs, you’ll be in good hands and can focus on planning the rest of your special event. 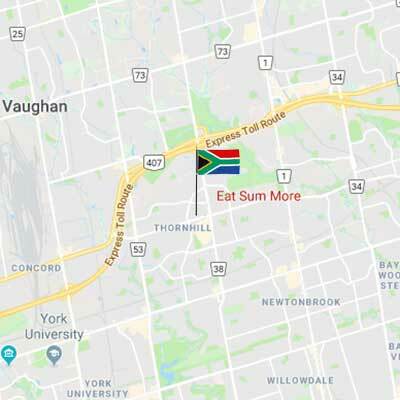 From small intimate private parties to big corporate events, our mission is simple: Bring unforgettable experiences, high-quality South African cuisine, and exceptional service to every Ontario event we cater. The Biltong Bar is an exciting new service offered by Eat Sum More, allowing you to provide your guests with high quality biltong at any event. Take a look at our packages to choose the most suitable option for your event. Bronze Package: Client picks up food in store. Silver Package: We will drop off food at your venue. Platinum Package: We will setup a Booth & drop off food at your venue. Please call, email or use the form for specific pricing. When is your event taking place?